to the "santeecrittersitting.com" home page. We are here to serve your pet sitting needs. a licensed pet care professional, founded Santee Critter Sitting in 2004. 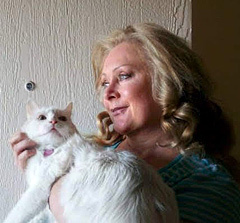 A true animal lover, She has years of experience working with pets of all kinds. Nancy has attended Pet Sitting University and is a member of thePet Sitters International Community (www.petsit.com). The site has my current proof of Pet Insurance, Bonding, Pet Pro Education,CPPS- Passed the Certified Professional Pet Sitter course and exam and displays the Approved Background Check. Happy and Satisfied Client Referrals are also included on my profile. Nancy has recently attended the Pet First Aid course sponsored by Pet Tech. Nancy has a working relationship with other local pet sitters to meet your pet sitting needs. Blossom Valley, Bostonia, Eucalyptus Hills, Fletcher Hills, Flinn Springs, Glen View, Johnstown, Lakeview, Morena, San Carlos, Winter Gardens & special requests.